1. Mum will light up when she realises we've planned a surprise party for her. 2. My grandma would light up when she talked about the olden days. A: Hurry! We're going to miss the train! B: Lighten up – there'll be another one five minutes later. 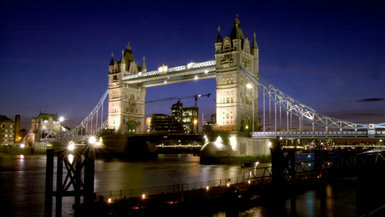 Tower Bridge in London has had a new lighting system installed which enhances the bridge's architectural features. Static lights have been replaced with bulbs that can vary in intensity and colour. The world-famous bridge gleamed white to celebrate the Queen's Diamond Jubilee and the more energy-efficient lights were switched on after that.